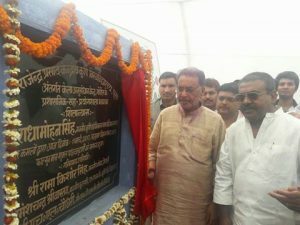 New Delhi: Union Agriculture and Farmer’s Welfare Minister Radha Mohan Singh said that Bihar and particularly Vaishali district is very suitable for the cultivation of bananas and large scale production of banana can change the fate of farmers. The Minister made this statement today on the occasion of the laying the foundation stone of the Banana Research Centre at Gorole, Vaishali, Bihar Centre. Shri Singh stated that Rajendra Krishi Viswavidyalaya, Pusa has got the status of Central Agriculture University only in October, 2016. After that the Government has established this Banana Research Centre to fulfil the aspirations of the banana growers of Vaishali. Banana Research Centre, Vaishali falls under Garole area and because of the ecological conditions of Garole, it has been selected for the establishment of this centre. He further stated that this centre will work in the areas of finding reasons of less production in banana, enhancement in acreage for cultivation, suitable utilization of the various parts of the plants, different products, marketing and value addition. Shri Singh said that Dr. Rajendra Prasad Central Agricultural University has already started the research work for doubling the income from banana cultivation. With starting this centre the research work will get more momentum. He was hopeful that with the cooperation of the researchers of this centre and with the participation of farmers, it would help to bring a new era of banana cultivation in Bihar and surrounding states like it happened in Maharashtra. Union Agriculture and Farmer’s Welfare Minister further stated that the farmers of Maharashtra have developed a domestic and export market with the help of 26 cooperative societies operating in the state and thus has given a new direction in the field of banana cultivation. By adopting high density cultivation, tissue culture, drip irrigation etc. Maharashtra is transporting high quality bananas to the entire country through 12-15 thousand Railway Wagons. Shri Singh further informed that the total production of banana in the country is around 14.2 million tons. India holds number one position in the world in the area of banana production and stands at number three in acreages which is 13 per cent of the entire acreage and 33 per cent of the total production. Among the states, Maharashtra is the largest producer followed by Tamil Nadu. Productivity of Maharashtra is 65.7 ton/ha, which is more than the average national production of 34.1 ton/ha. Banana is grown in Bihar in around 27.2 thousand hectare, production is around 550 thousand tons and average productivity is 20.0 ton/ha, which is very less than the national average.